Tours swiss with percussionist Barni Palm and later Japan with Pianist Holger Mantay. Is lecturing at Kyoto University, Tokushima University, Doshisha University, Nagoya City Senior Highschool, GakushuIn Daigaku university Tokyo and starts workshop for kids in No theatre. Produces and directs his play “Ube no Ubeteki” – Tales of Hikari Genji at the prefectoral cultur hall in Kyoto. Starts lecturing with the tile “Time and space in Japanese music and No Theatre” at universities and schools in Japan and abroad. Plays as a representant of Japanese classical music at the concert for old and new cmusic from Japan and Korea at the villa Stuck in Munich. This was braodcasted by national german TV Bayrischer Rundfunk. Tour in Japan with saxophon player Gert Anklam, Beate Gatscha (Dance) and Holger Mantay (Piano). 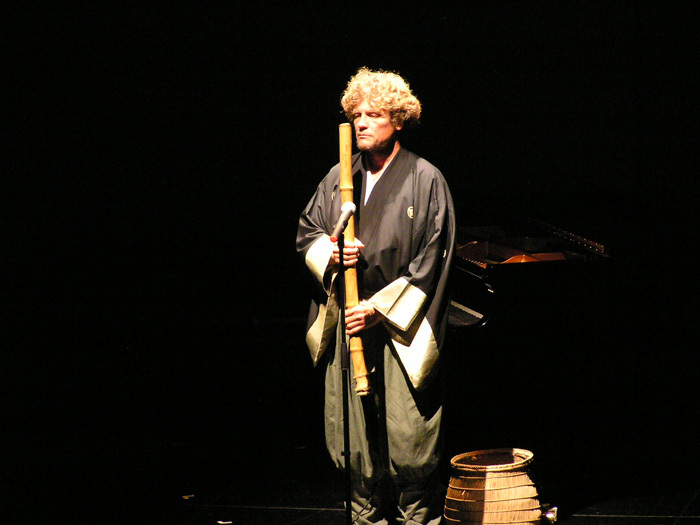 organizes a tour for Shakuhachi playing Zen monks to Germany and Auschwitz. Plays at the international music festival in Kiew ias part of the japanese Group “Kirara”. Works as a reporter for the NHK TV Osaka. Participates at the komuso gathering at the Shitennoji Tempel in Osaka with “San-An” after Watazumi Do Roshi. Tours Germany with Guitar player Nakamura Yoshimitsu and Japanese drum (Taiko)-player Iwakichi Yamashita. Is on NHK Radio Kyoto. Session with Gert Anklam, a saxophon player from East Berlin. On air in Radio Berlin (Rias) and NDR Hamburg. Organizes from now on every year the international Musicfestival “Kawaramono” in the mountains north of Kyoto, which was broadcasted by the NHK TV. Concert Tour “Global Rider Meeting” with Okura Shonosuke through Japan und China. Plays for the brother of the Tenno mikasa no miya his original “Tauta”. Composes “Tauta” for three Celli, Guitar, Shakuhachi und No-chants on CD “Tauta”. Solo-conzerts at Schlachthof Freiburg. Monsun Theater Hamburg, and Packhaus Theater Bremen. Starts studying No-play at the Kongo No-School in Kyoto and Shakuhachi with Izu Hiroshi, master of Tozan school. Tours Germany with the Circus tent-theater Hundertfleck. Studies Pantomime with Lindsay Kemp at Covent Garden and Jazzvoice/Jazzdance at the Ovalhous Theater London. Debut as an actor in: “Faust”, a Circus Maximus Production in Marburg. born in East Germany. Studies Cello with Frau Lorant, a Cello player at the Philharmonika Hungarica in Marl.